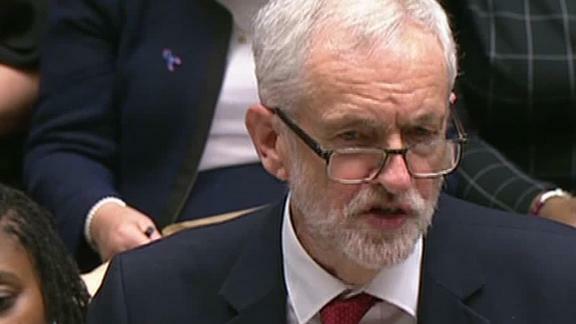 UK opposition leader Jeremy Corbyn called for a vote of no confidence in Prime Minister Theresa May's government following the defeat of her signature Brexit deal in the House of Commons. British lawmakers have soundly rejected Theresa May's Brexit deal, in the biggest defeat for any UK government in the modern parliamentary era. After 200 speeches across eight days of debate, members of the House of Commons ignored the Prime Minister's final pleas and threw out the deal by 432 votes to 202. The 230-vote margin of defeat -- more than the previous record of 166 in 1924 -- means the Prime Minister now faces a deep political crisis, with no clear path out of the mess. Acknowledging the scale of the defeat, May said her government would give time for MPs to debate a motion of no-confidence. Speaking moments after May's humiliating loss, opposition Labour leader Jeremy Corbyn called the defeat 'catastrophic' and confirmed he would trigger a no-confidence vote. It would allow the House of Commons to 'give its verdict on the sheer incompetence of this government,' he said. May now has 24 hours to save her government. If she loses the vote, it makes a general election more likely. 'The government has heard what the House has said tonight, but I ask members on all sides of the house to listen to the British people, who want this issue settled, and to work with the government to do just that,' May told lawmakers. Notwithstading the confidence vote, the Prime Minister now has three days to set out Plan B. In the coming days, she's expected to meet European leaders in Brussels to seek further concessions. During her speech after the vote, May also offered cross-party talks with lawmakers as an attempt to try and figure out a way forward. 'Every day that passes without this issue being resolved means more uncertainty, more bitterness and more rancor,' May said. President of the European Commission, Jean-Claude Juncker, also warned of the ticking clock. 'I take note with regret of the outcome of the vote in the House of Commons this evening. I urge the UK to clarify its intentions as soon as possible. Time is almost up,' Juncker wrote. Tuesday night's vote was the product of more than two and a half years of negotiations, after 51.9% of British people voted to leave the EU in 2016. And with just 73 days left before the country is due to leave the EU, the UK is no closer to knowing will happen post-March 29. Inconveniently for May, untangling a 45-year marriage was not as easy as some Brexiteers claimed it would be. Particularly when it comes to the contentious Irish backstop -- an insurance policy to prevent a hard border in Ireland -- which has been a thorn in the side of May's deal. May's biggest challenge came from hardline pro-Brexit lawmakers within her own Conservative party -- their opposition to what they see as an overly soft exit has dogged her deal from the start. Going forward, possible scenarios for the UK include an attempted (but probably doomed) renegotiation with the EU by May, extending the article 50 process, a collapse of the Conservative government and a general election, a change of prime minister, a second EU referendum, scrapping Brexit altogether, or crashing out of the EU with a no-deal.